In the last week I have spent many hours out in the hills looking for roosting Long Eared Owls and day hunting Barn Owls. 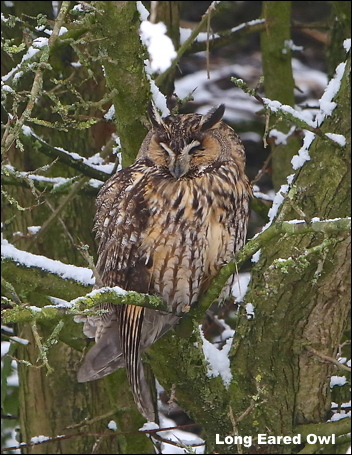 After yesterdays snowfall a single Long Eared Owl was a nice bonus in the snow-covered trees. With their eyes screwed-up they always look asleep but this bird is fully aware of my presence. This last week I have shown my films for the last time in Rochdale, Glossop and Leigh to societies where I have been going to for more than forty years. The responses from the audiences have been over whelming and at Leigh included a vote of thanks that lasted sixteen minutes! !